Soon after the successful launch of Patanjali-BSNL Swadeshi Samriddhi SIM cards by Baba Ramdev, a latest launch of Desi Messaging App with the name Kimbho has been done on May 30th, 2018 (Wednesday) to beat Whatsapp in India. Baba Ramdev's Patanjali being developed continuously as a revolution in India has once again come up with an idea of messaging app similar to the functionalities of Whatsapp. Whatsapp has a biggest number of users all over the world along with India being one of the major country following the best quality messaging service including voice calls and video calls as well. In this current edge of modern digitization, almost all the people having a phone in their hand opts to keep a smartphone only with Whatsapp being one of the installed applications. It has become the necessity of the people now-a-days to send messages instantly along with advanced media files such as photos, music, videos etc. Soon after the launch of Whatsapp in India, the difficulty of sending media files along with the text messages got completely vanished as the app was itself sufficient to manage all such abilities with ultimate efficiency. During the course of time, the app introduced regular updates in the functionalities and it became the necessity of the users all around. Not only the children and the youth, the people of all the age groups who were not even aware of the basic IT related functionalities as well as app handling kind of habits, even started to use Whatsapp frequently and learned the things such as sending of messages, photos, music, videos along with doing voice calls and video calls very frequently. 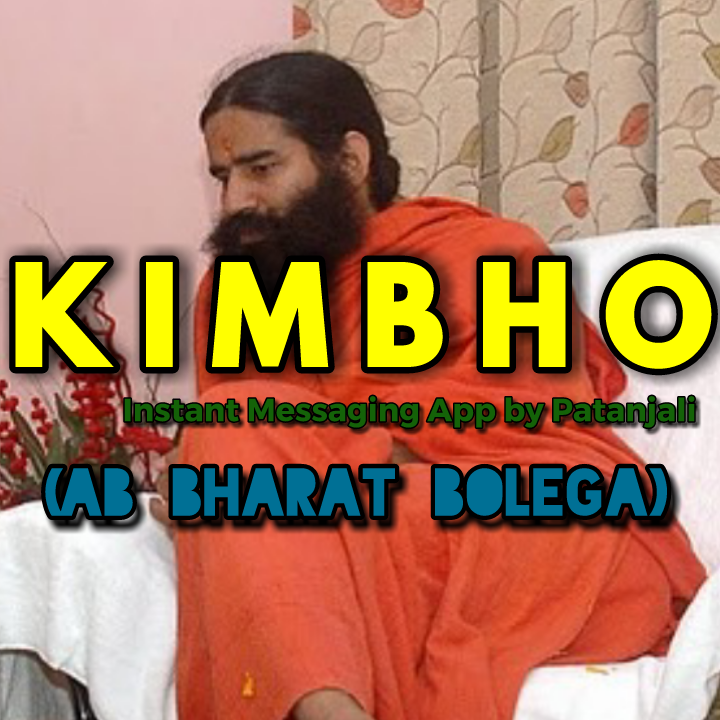 Baba Ramdev being one of the great business observers has noticed the influence and the dominance of such business opportunities in the field of Telecom and IT and accordingly launched Patanjali SIM followed by a biggest challenge to Whatsapp with the name 'Kimbho - Desi Messaging App' having all the functionalities similar to that of the Whatsapp. The app has also been released in the Google Play store for instant downloads into the smartphones. Being successfully launched under the Baba Ramdev's flagship company Patanjali, the concerned Patanjali spokesperson of Aurveda S.K.Tijarawala also tweeted about the launch of this desi messaging app with the name Kimbho and even forecasted about the grand success of this messaging app which will be a biggest challenge for Whatsapp in India. #SwadeshiMessagingPlatform has been introduced by the concerned and the news regarding it's open availability for free download from the Google Play Store has also been updated among the citizens. Tag line for Kimbho app will be 'Ab Bharat Bolega'. Prior to the launch of this desi messaging app, Patanjali on May 27th has also launched a Patanjali-BSNL Swadeshi Samriddhi SIM cards which has been made initially available only for the employees as well as the office staffs of Patanjali organization only. It's full fledged launch after few periods of time will definitely benefit the citizens of India as compared to the other network providers ans as per the available news reports, people will get 10% discount on Patanjali product by utilization of this card (As per the reports by ANI). Kimbho has been launched successfully in the Google Play Store as a real desi messaging app having the features such as private chat, group chat along with the voice as well as the video calling facilities. Best liked features already been used in other messaging apps have also been introduced in this Kimbho app such as instant sharing up of texts, images, audios, videos, stickers, GIFs etc to name a few. Entire description of the app can also be read and understood from the Google Play Store where the app has been put up for downloads. The app is reported to be one of fastest messaging apps powered by the Socket Technology ensuring the fastest and instant real time messaging with the contacts. Keeping in view the security features and respecting the privacy of the persons, the app's sent messages has been kept encrypted by AFS technology. Ghost chatting as well as the features such as automatically deletion of the messages has also been introduced along with Kimbho app. Kimbho app does not keep any user's data and information on the servers or cloud keeping in view the further problematic issues and respecting the user's privacy. Themes creation facilities launched along with the app makes it different from the other available messaging app such as Whatsapp. This feature adds more attractive interface of the users with the app. The app has been launched with 22 GB in size and the total downloads of the app till date from the Google Play Store is 1000 with regular increase in the number. The features listed above proves the Kimbho app to be fully loaded and highly configured. Users privacy has been given a special importance and accordingly an advanced technology with the name AFS technology has been utilized in the app. Better encryption of the messages will yet play a major role for putting the customers into confidence and thereby using the app in place of the other messaging apps with extreme level of confidence. The initiative launched by Baba Ramdev must be respected by the citizens all over the India and the app must be downloaded and used to become habitual with the features very quickly. Before the launch of this messaging app, several other apps were also launched following the popularity of Whatsapp messaging app but Whatsapp has been noticed standing steady as yet. Let us look about the popularity of this Indian messaging app by Baba Ramdev that whether the app wins the race or simply keep itself walking along with the gathering.